Over the past 20 years, defined contribution retirement plans have evolved quickly, both structurally and legally. Corporate governance structures and internal resources have struggled to keep pace, exposing companies to potential legal liability while also creating administrative inefficiency. Reorganizing may allow the company to delegate certain responsibilities that otherwise consume key personnel’s time. Committees can be organized in a variety of different ways, depending on how the plan sponsor thinks their resources line up best. Large plan sponsors typically elect one or more committees specifically to manage their retirement plan(s), though some choose to form a more generalized “employee benefits committee” with a broader scope. The latter approach may work for other benefits (e.g. health plan, PTO, insurance benefits, etc. ), but it is generally not advisable to have a general benefits committee include the ERISA retirement plan in their purview, as such plans require specialized skills, training, and attention. Regardless, under most arrangements, basic oversight responsibility and decisions affecting a company’s financial commitments still boil up to the Board of Directors and its designated officers. Therefore most committees designate a liaison to 1) periodically report to the Board at a high level that the committees’ obligations are being met, and 2) to obtain approval where the company’s finances are involved. 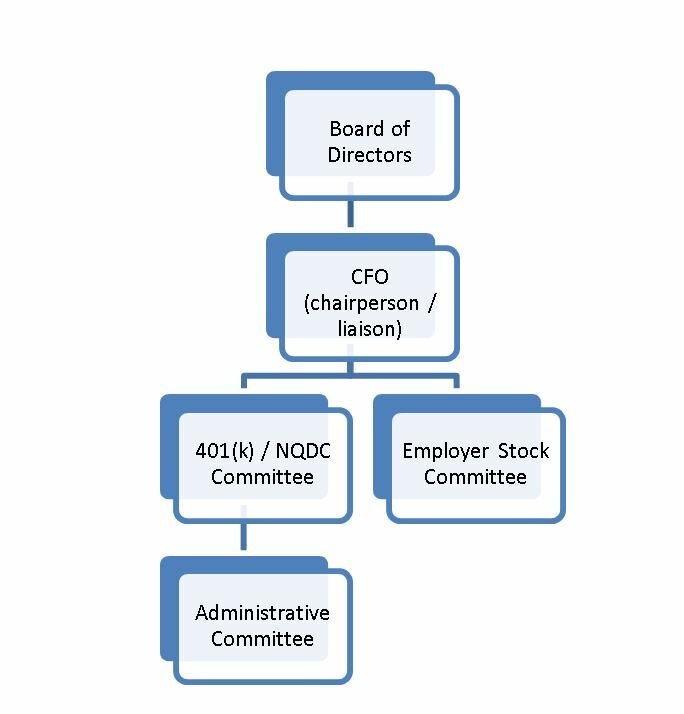 To the right is a sample governance structure for a large company with employer stock in their retirement plan. Under this structure, the Board of Directors would name committees with the responsibility of managing the retirement plans. Those committees would either report to or be chaired by an executive of the firm that is responsible for reporting to the board and obtaining approval on measures where necessary (generally decisions that affect company finances, such as match and profit sharing formulas). Members to include: Preferably, all committee members will have a basic understanding of financial markets and retirement plans. Also, the 401(k) / NQDC Committee should have one or more members representing the HR staff. We recommend at least two, but no more than six, fiduciary (voting) committee members, plus one or two non-fiduciary members (if desired). Larger committees are often too difficult to schedule, and they’re typically less efficient. Committees with too few members may be deficient in terms of checks and balances. In our experience, the sweet spot for 401(k) committees seems to be three-to-four voting members. We also recommend including members that can reasonably be expected to be at the company for a long time, as it takes time to train fiduciaries and acclimate them. Membership traits to include/exclude: This aspect may come across as obvious, but it may be the most critical aspect of plan governance. Successful committees include members that are open-minded, have good listening skills, and that place success over pride. Plan sponsors are wise to avoid appointing employees that will have a tendency to disrupt, derail, or otherwise hinder the committee. All committee members should receive training on their duties and responsibilities. Fiduciary training is a service that your plan advisor should be able to help you facilitate. In addition to formalizing committees at the Board level, increasingly plan sponsors are asking committee members to provide formal acknowledgement of their roles and responsibilities. From a legal standpoint, such acknowledgement is redundant, as fiduciary status is based on function, not title. However, the fact is that few fiduciaries enter into their role with open eyes, and without such a procedure, too many think it’s enough to show up. The signature process is designed to help committee members understand the importance of their fiduciary role, and it provides a nudge that causes many to treat it as more than just another set of meetings they must attend. In our currently evolving world, a little structure can go a long way to ensuring that plan governance is being effectively carried out. Although we believe strongly in the structural aspects presented here, these recommendations are not one size fits all and every plan should work with their legal counsel and internal personnel to design a governance system that fits the particular organization. Disclaimer: Past performance should not be taken as an indication or guarantee of future performance, and no representation or warranty, express of implied, is made regarding future performance. The information contained herein has been compiled from sources believed to be reliable however MGIA makes no representations and has not conducted independent research as to their accuracy or completeness. This report is provided to you for information purposes only and should not be considered as an offer or solicitation to buy, sell or subscribe to securities or other financial instruments. Alternative investments are often complex investments, often involving a high degree of risk and are intended for sophisticated investors capable of understanding and assuming the risks involved. The market value of any alternative investment may be affected by changes in economic, financial and political factors, time to maturity, market conditions and volatility, and credit quality of any issuer or reference issuer. The opinion expressed herein is that of MGIA and is subject to change without notice and should not be relied upon in substitution for the exercise of independent judgment.